During the past two weekends, many listeners noted that the RSID for the Olivia modes did change the mode. In an attempt to fix that problem, I have amplified the RSID for this weekend’s Olivia 32-1000 by 2.5 dB. Also, please make sure that Fldigi is configured to search the passband for the RSID. Such a search is necessary given that the MFSK32 is centered on 1500 Hz, but the Olivia is centered on 2000 Hz. In Fldigi: Configure > IDs > RsID: select Searches passband. In newer versions of Fldigi, you can alternatively left-click on the RxID in the upper right of the main screen, then select Passband. We are experimenting with Olivia at 2000 Hz because text modes at these higher frequencies might be able to escape interference consisting of voice, music, and even some types of noise. Soon we will return to less nerve-wracking shows where all the modes are at the same audio frequency. Last week, on the show, I erroneously introduced the Olivia 32-1000 and Olivia 32-2000. Apologies for the confusion. Thank you for your reports from last weekend. Reception and results were good in most parts of the world. I have sent MFSK galleries from last gallery to everyone who sent reports as of Thursday. 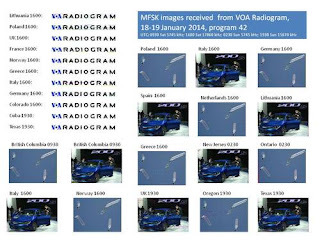 If you want to see images posted by listeners during, or shortly after, the weekend broadcasts, visit https://twitter.com/voaradiogram . I retweet the images submitted by VOA Radiogram listeners. You do not need to be a Twitter registered user to read the tweets. If you do register, you can send your own MFSK32 images, screen captures of text, etc. Please include @VOARadiogram in your tweet, and follow @VOARadiogram.